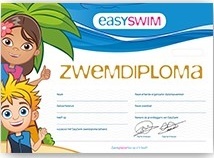 At Zwembad Den Ekkerman, we teach children the skills needed to obtain the EasySwim Diploma. Den Ekkerman is fully licensed to offer these classes. Swimming lessons are given on Monday through Saturday; 45 minutes per lesson. It is optional to take classes either once or twice a week. Of course, children who swim twice a week will learn the necessary skills more quickly and thus acquire their Badges sooner. The minimal age for these basic classes is 5 years old. The EasySwim Diploma: for a lifelong enjoyment of swimming! Swimming lessons according to the EasySwim method. A method in which your child has loads of fun and is intrinsically motivated. With the EasySwim method we want your child to be able to swim, splash and play in the water for hours at a time. With the EasySwim Diploma your child posesses the neede swimming skills to play safely in and around the water. Therefor safety and fun are the pillars of the EasySwim Diploma. During all our swimming classes, we require children to wear a lifevest. This is how we work according to the Easy Swim Method: a safe and effective program which achieves maximal results with minimal floating ability. 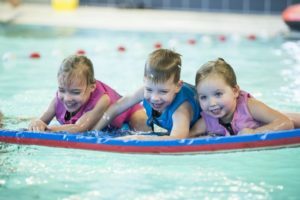 In our experience, wearing a lifevest helps children to learn swimming techniques faster. Before children are allowed to go into the deep pool, they must be able to swim without a vest. Of course, our swimming classes are given in a most child-appropriate manner and we aim to accommodate at individual levels. We make use of an online score-module, on which you can follow your child’s progress on a weekly basis. Every two months we organize Swimming Tests. In other words: this is the maximum timespan so there are no long waiting lists involved. A Swimming diploma that is fully adapted to the perception of your child. The pillars of the EasySwim Diploma (safety and fun) are expressed in 9 real life situations. 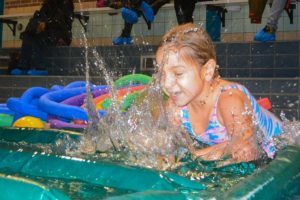 These situations are fully adapted to the perception of your child and are a combination of all the elements needed for the right swimming skills. The diploma focusses on learning and applying the needed skills within all sorts of recognizable situations. The EasySwim Diploma stands for high swimming safety and makes learning how to swim a lot more fun for your child.